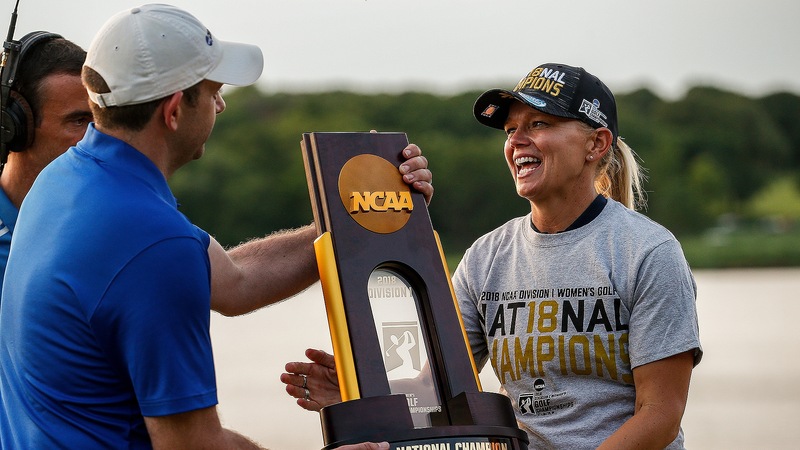 STILLWATER, Okla. – Five hours before the final match at the NCAA Women’s Championship, Arizona coach Laura Ianello sat cross-legged on a couch in the Holiday Inn lobby and broke down four times in a half-hour interview. It’s been that kind of exhausting season. From poor play to stunning midseason defections to a stroke-play collapse, Ianello has felt uneasy for months. She has felt like she was losing control. Felt like her carefully crafted roster was coming apart. So to even have a chance to win a NCAA title? A moment that seemed impossible six months ago became reality Wednesday at Karsten Creek. Arizona continued its magical run through the match-play bracket and knocked off top-ranked Alabama to capture its third NCAA title, with junior Haley Moore – who first rose to fame by making the cut at an LPGA major as a 16-year-old – rolling in a 4-footer to earn the clinching point in extra holes. All throughout nationals Arizona was fueled by momentum and adrenaline, but this was no Cinderella squad. The Wildcats were ranked ninth in the country. They won twice this spring. They had four medalists. They were one of the longest-hitting teams in the country. But even before a miracle end to NCAA stroke play, Arizona needed some help just to get here. On Christmas Day, one of the team’s best players, Krystal Quihuis, texted Ianello that she was turning pro. It may have been a gift to her parents, for their years of sacrifice, but it was a lump of coal in Ianello’s stocking. Even more bad news arrived a few weeks later, when junior Gigi Stoll told Ianello that she was unhappy, homesick and wanted to return to Portland, Ore. Just like that, a promising season had gone off the rails. Ianello offered her a full release, but Stoll looked around, found no other suitors and decided to remain with the team – as long as she signed a contract of expected behavior. Stoll eventually bought in, but the rest of the team was blindsided by Quihuis’ decision. “We became even more motivated to prove we were a great team,” said junior Bianca Pagdanganan. It also helped that Yu-Sang Hou joined the squad in January. The morale immediately improved, not least because the players now could poke fun at Hou; on her fourth day on campus she nearly burned down the dorm when she forgot to add water to her mac-and-cheese. Early on Ianello and assistant Derek Radley organized a team retreat at a hotel in Tucson. There the players created Oprah-inspired vision boards and completed exercises blindfolded and delivered 60-second speeches to break down barriers. At the end of the session, they created T-shirts that they donned all spring. They splashed “The Great Eight” on the front, put the state of Arizona and each player’s country of origin on the sleeves, and on the back printed their names and a slogan: If you want to go fast, go alone. If you want to go far, go together. “I can’t think of anything else that better embodies this team,” Radley said. This spring, they rallied together and finished no worse than fourth in a tournament. Through three rounds of stroke play here at the NCAA Championship, they used their distance advantage and sat third in the standings. Then they shot 17 over par in the final round, tumbling outside the top-8 cut line. They were down to their final chance on the 72nd hole, needing an eagle to tie, as Pagdanganan lined up her 30-footer. She dramatically drained the putt, then gathered her teammates on the range. “This means we were meant to be in the top 8,” she said. Less than an hour later, they beat Baylor in the team playoff to earn the last match-play berth. Ianello was so amped up from the frenetic finish that she slept only three hours on Monday night, but they continued to roll and knocked off top-seeded UCLA in the quarterfinals, beating a pair of Player of the Year contenders, Lilia Vu and Patty Tavatanakit, in the process. In the afternoon semifinals, they jumped all over Stanford and won easily. It was a cute story, the last team into the match-play field reaching the final match, but a stiffer challenge awaited the Wildcats Wednesday. Alabama was the top-ranked team in the country. The Tide were a whopping 110 under par for the season, boasting three first-team All-Americans who were so dominant in their first two matches that they trailed for only two of the 99 holes they played. Ianello already seemed to be bracing for the result on the eve of the final match. But their wild ride continued Wednesday, as Hou won four holes in a row to start the back nine and defeat Alabama’s best player, Lauren Stephenson, who had the best single-season scoring average (69.5) in Division I history. Then sophomore Sandra Nordaas – the main beneficiary after Quihuis left at the midway point of the season – held on for a 1-up victory over Angelica Moresco. And so Arizona’s national-title hopes hinged on the success of its most mercurial player, Moore. In the anchor match against Lakareber Abe, Moore jumped out to a 2-up lead at the turn but lost the first three holes on the back nine. By the time Radley sped back to help Moore, in the 12th fairway, she was frazzled. Moore played solidly for the rest of the back nine and took a 1-up lead into the home hole. She didn’t flinch when Abe hit one of the shots of the entire championship – a smoked 3-wood to 12 feet to set up a two-putt birdie and force extras – and then gave herself 4 feet for the win on the first playoff hole. She sank the putt and within seconds was mobbed by her teammates. In the giddy aftermath, Ianello could barely speak. She wandered around the green in a daze, looking for someone, anyone, to hug. The most trying year of her career had somehow ended in a title.